I am always looking for inspiration in different places and from different sources. I have a great group of friends and family that share an uncanny ability to inspire me. However I still value being motivated by those less fortunate than myself. I am especially inspired by those who are clearly working harder than I am to achieve their goals. It is easy to take life and the people that love you for granted. When I meet someone who reminds me of this fact, I am driven to tell their story with the hope that it can motivate others. One day three years ago during a routine trip to the gym, where I was feeling less than set astir, I noticed a young man looking considerably more focused and working harder than myself. That man’s name is Terrence Tate. Terrence does not like to make excuses and believes in self-discipline. He spends six days a week in the gym striving for total fitness. 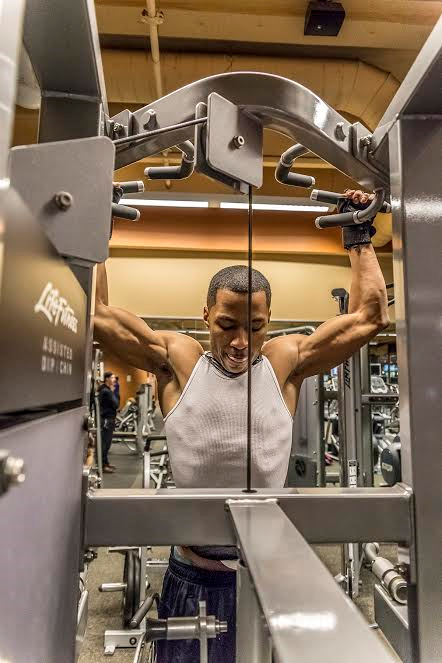 For Terrence, total fitness results in a healthier life which is something he knows he must value greatly. From the waist up Terrence is a ripped machine much like his favorite athlete Lebron James, but from the waist down he lives with a particular set of complications. Terrence is a T4 paraplegic and does not have the ability to use his legs. 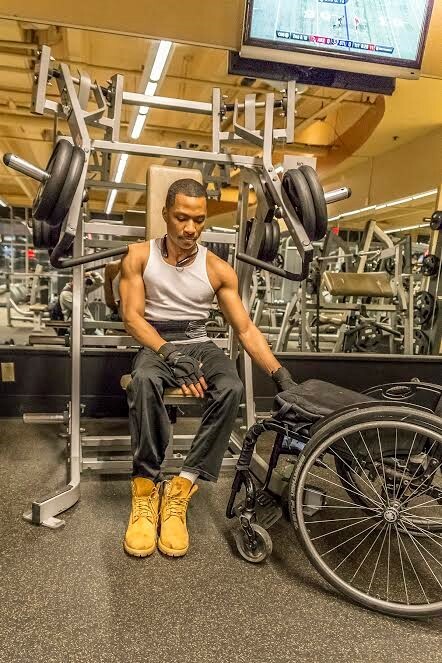 I noticed Terrence lifting himself back and forth from weight machines to his wheelchair and I was astonished by his work ethic and how he did not need the help of anyone. I had to find out more about Terrence because I had this feeling he had a great story to tell. I did not want to bother him at first so I waited until I felt he was winding down his workout. I intended to say hello and ask him if he wouldn’t mind speaking to me when he had time, but by the time I was ready to leave he was already gone. I hoped the opportunity to speak to him was not lost so I asked the person working at the front desk to speak to the manager. I asked the manager if I left my name and number would he please give it to Terrence the next time he saw him. I explained that I wanted to speak with Terrence and possibly write about his story. Thankfully they agreed to help me but I honestly was not expecting to hear back from Terrence. After a few text messages back and forth over the span of a few days we finally set a time and place to meet; and thus I finally got to hear a great story about an even greater person. Terrence was a gifted basketball and baseball player in high school. He enjoyed hanging out with friends and discovering new music. He planned on attending a technical trade school after graduating with the intention of learning a multitude of skills he felt would help land him a solid job. He grew up seeing so many people in his neighborhood live life on the streets but he knew he wanted to choose a different path. In 2006 Terrence went out on the town for a casual night with childhood friends. After a few hours of reminiscing about old times, the night was winding down for Terrence. While walking to his car he heard a loud confrontation happening behind him and noticed one of his friends was involved in a conflict with a stranger. Terrence in his kind-spirited nature tried to prevent a fight between the two men and when stepping in front of his friend; the stranger pulled a gun and shot Terrence in the neck. He was immediately rushed to the hospital by his friends who were at the scene. None of them were sure if he would survive. The bullet hit Terrence’s T4 vertebrae paralyzing him from the waist down. The man who shot him was arrested less than 24 hours later as many witnesses’ from the scene were able to identify him. Terrence was only 21 years old when he was on the wrong end of a bullet. “I was in the wrong place at the wrong time and truthfully should have never been in that place anyway,” Terrence explained. Terrence went on to describe how it was difficult to initially stay positive about being shot and that he uses the self-discipline that fitness requires to not get consumed by mental breakdowns due to his unfortunate injury. 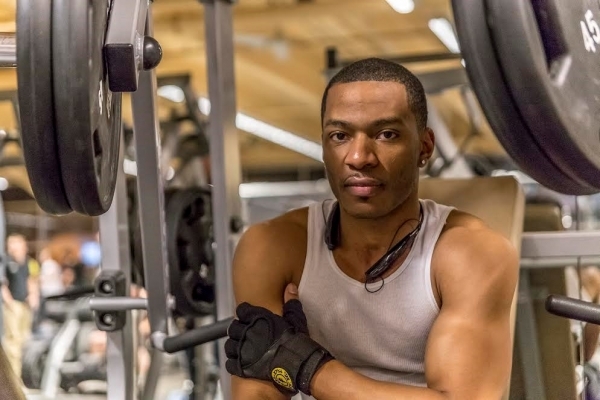 Terrence explained that it was the lack of motivation in others that helped him see the true beauty in life and is what inspired him to get healthy and stay healthy. He said once he got healthy not only physically but mentally, he wanted to try and help others who he thought might be dealing with the same struggles. “It is difficult to maintain a healthy weight when you are in my situation. You have to watch what you eat and be as active as possible.” Terrence loves the feeling of being independent and being healthy. Being in the gym and seeing actual changes in his physique has helped him mentally overcome the everyday struggles of being in a wheelchair. “When I am in the gym I don’t think about anything else other than progress. At first I did a few exercises at home but I started going to a regular gym so I could do things like everyone else.” Terrence doesn’t like anything modified to his situation other than the hand controls in his car which enable him to drive. Terrence still keeps hope alive that one day he will walk again, but in the meantime he wants to be an inspiration to others that have the same hopes and especially to those who are having trouble embracing the harsh reality of being in a wheelchair. During a recent trip to the original location of Terrence’s rehab, he learned that they do need people like him to answer questions and help others acclimate to life in a chair. He is planning on going a couple days a week to help mentor those who are new to the chair. I met with Terrence at the hospital where he started his rehab. I wanted to see where he began his road to recovery. I witnessed the strong connection he still has with the people who helped him recuperate from his injuries. Those are the people who were his inspiration and now he feels he can be the same kind of inspiration to others. While at the hospital I learned that Terrence is known for his giant smile and his ability to warm the room. Everyone was excited to see him and could not wait to hear what he had been up to. Terrence didn’t know it, but he had already been an inspiration to so many people; even those not in a wheelchair.